I have an issue with RC4 and my proxy, it worked before but our proxy changed and I don't know the type. However I can bypass the proxy with TotalCommander (settings_TC.png), and use the same settings for VIPM (settings_VIPM.png). The error file is attached as well. Is there a chance that the new proxy configuration does not support "basic" authentication and requires a more sophisticated authentication style? Can you ask your network admin to check this and possibly add support for basic authentication? Or, if you are able to find out more information, we might be able to implement the specific authentication mechanism. One more thing... are you using an empty username, or did you simply remove that for the screenshot? If you are using an empty username, that might be a possible source of the issue in VIPM. server\department_name so maybe the backslash or the underscore bugged me? It sounds like your proxy is using NTLM authentication a proprietary Microsoft standard (based on the domain\user_account format). Can you possibly send (by email) a log of the HTTP transaction with the proxy? You can capture this with a program, such as ethereal. (we figured it out) it is NTLM. Are you planning on building a NTLM client, or should I install a local proxy? I found some low level information. Thanks for the link to NTLM info. At this time, there is no plan to support NTLM, since (1) we have not received many requests for this and (2) it would require a significant ammount of development and testing on our part (for example, we would need to set up a Windows proxy server, etc.). Also, since work-arounds (like the local proxy) are possible, those few users who do need NTLM support, still have a way of making VIPM work on thier network. That said, OpenG does have an HTTP library (which is not yet available on VIPM) and if someone were to add support for NTLM proxy authentication, it would make it easy for us to support it in VIPM. I realised recently a solution with data-socket to penetrate our proxy, where I was triggered by your post on LAVA, and this post. Maybe that's an option for VIPM? Yes, that might be an option. The thing that I don't like about Data Socket is that you have almost no visibility into or control of the data transfer. Also, it is not cross-platform. Another alternative would be to simply have an option to use the Windows API functions (WinInet) for downloads. I installed the NTLM local proxy and it works like charm! 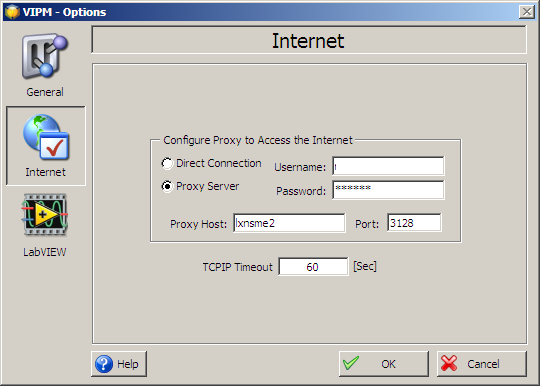 The NTLM proxy is even accesible from other computers (it can be turned off).